Outlands is a highly customized gaming world featuring a brand new map, new monster animations, new clothing items, custom hues and more. We have made the installation process as easy as possible. Simply download our Launcher, choose your install directory, and away you go! Disable your AntiVirus or make an exception for the Outlands launcher prior to installing. 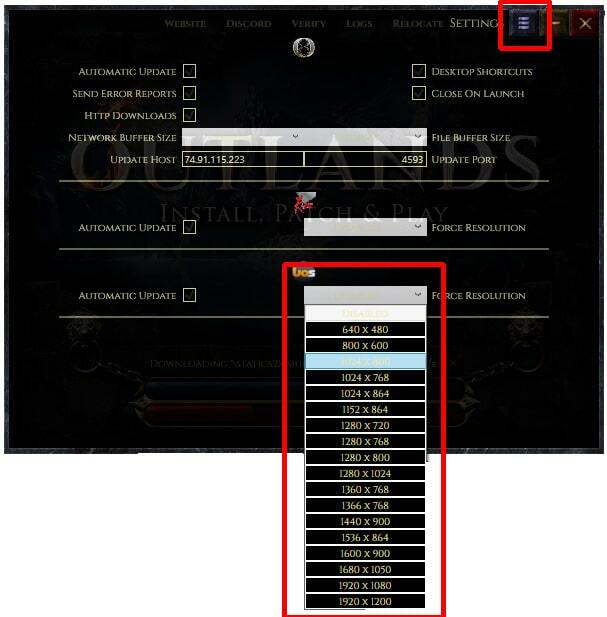 If the launcher cannot connect to the internet, it cannot download and install the required files. Right click “OutlandsUO.exe” and select “Run as Administrator” when you first install Outlands. “Run as Administrator” will fix 95% of any issues you experience moving forward. Read and agree to our Shard Rules & Naming Guidelines to download our Launcher. Choose your installation path and click the “OK” button. We recommend you install it to the default directory as shown below. Download the Outlands game files. Steam and Razor come pre-packaged with the installation. The total installation is approximately 2.5gb in size. Once you see the “Operation Complete” indicator, click the Verify button middle-top of the Launcher to confirm everything has been downloaded from the server. Once installation is complete, choose Razor or Steam from the middle icons to login to Outlands! Outlands features auto-account creation, so simply pick your assistant of choice and login! Relocate Allows you to alter your file installation path, which isn’t recommended unless necessary. From the dropdown menu next to your assistant of choice (Razor or Steam), you can choose your resolution. Outlands does not use map1.mul, therefor this is an inconsequential error (not game altering) related to your computers Virtual Memory and Steam’s loading protocol. Steam requires 2GB of free Virtual Memory to load, so you may notice you don’t get this error after you reboot your computer. Steam is hardcoded to load .mul files in a certain order, and since Outlands uses heavily customized files, the size of the size of the files causes steam to error on loading map1. If Steam was an open source program, we could fix this error, however the source code is not available. Simply click “OK” and login as normal. This issue happens most commonly when another instance of Razor is installed on the machine previously or at present. Navigate to your Outlands /Razor/ directory and launch Razor directly. If this doesn’t solve the issue, try to install a new version of Razor and point it to Outlands files. If you are encountering issues, please join us in Discord.